I am so excited to be hosting TGIFF this week for my first link up. When I told my mother-in-law about the link party she laughed and asked if I'd be serving tea and sandwiches at the party. Believe me, I would if I could, but cookies not sandwiches. Chocolate chip or peanut butter? I am celebrating today because I have finally finished my And Sew On wall hanging! I have had so much fun with this project. First of all, Kristy's patterns are so cute, even when they have a ridiculous number of pieces (I'm looking at you, sewing room block! ), and they come together surprisingly well. Then I started playing with the free motion designs. I tried spirals and wavy lines. Then more spirals and some straight lines. Some spirals all by themselves and lots of feathers in the border. I loved this quilt more with each new design. I didn't know what to do for the sewing room block, so I left it for last. I ended up just outlining everything in the picture because I didn't want to add anything that would take away from the piecing. Unfortunately, I'm still not all that great at free motion quilting along a seam line, so there are lots of wobbles. I tried to remember to stay more than 1/4" away from the edge while doing my feathers, but a few of them still disappear into the binding. For the back, I randomly stitched rows of 1 1/2" strips of fabrics used in the blocks on the front, along with a few pieces of the backing fabric. And yes, these pictures were taken with the quilt laying on the snow delivered by the blizzard that just blew through. Hopefully this is the last of the snow! While you're here, have you entered my giveaway to win a Craftsy class? Click here if you haven't. Who wouldn't love a free class? Now what are you celebrating this week? Link up your finishes (and only finishes, please) so we can celebrate with you. Then visit a couple of other links to celebrate their finishes too, and don't forget to leave some comment love. We all love comments! Please include a link in your post so others can find their way back here and join the party. Your quilting looks great!!! :) Well done! If you hadn't show the feather close up, I never would have noticed. Thanks for hosting! Beautifully quilted! And reallt like how you chose to make the back too! Wow, Leanne, beautiful quilting! It's my first visit here (I think). thanks for hosting the TGIFF linky party! 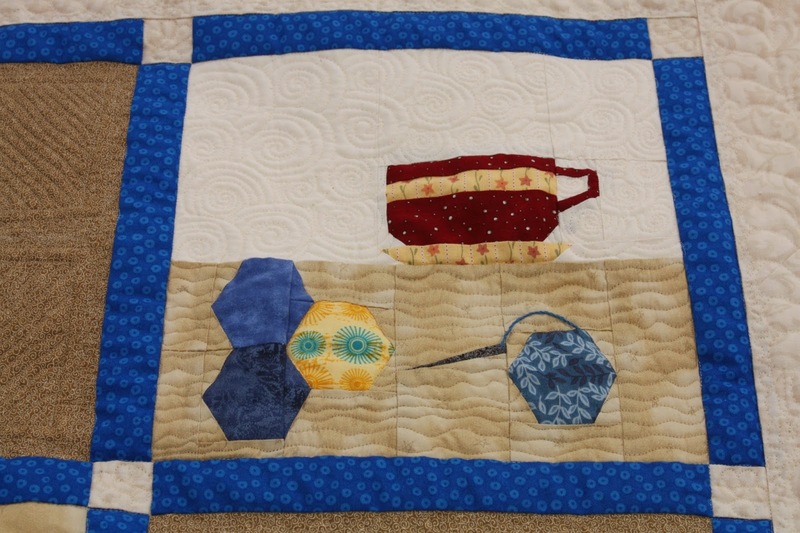 I'm jealous of your quilting! Love how it appears on the back! Such a lovely finish! Your quilting is amazing! Are you doing Kristy's Sew Kitschy BOM too? Choclate chip cookies and tea sounds great! Thank you! I love your quilting, beat me, your'a a mile ahead. Congrats on your lovely finish! Chocolate chip for me too Leanne! Congratulations on a great finish, your wallhanging looks wonderful. That's a wonderful finish, and your FMQ is great! Great finish, Leanne! I like how you interspersed the paper pieced blocks with simple blocks. Beautiful quilting too! Thanks for hosting TGIFF! Your FMQ is gorgeous. Do you use a special quilting machine? Or your normal domestic sewing machine? Did you do the FMQ free hand or have a pattern "stencilled" on? Sorry for all the questions, I am about to embark on yhe FMQ journey, but am ever so chicken to start. Beautiful quilting! I love the scissors block....You have done a great job! I had not seen this pattern before. You did a lovely job with it. I LOVE your backing! Lovely quilt and so beautiful the quilting. Thanks for hosting TGIFF! Fun! I love the added quilting. I was not brave enough to do that :-) Well done! Well done for getting it finished! I never did finish mine - and I still have the last block to sew. You have given me some inspiration to finally finish it!!! What fun sewing room blocks!! wow what a great quilt. I love the quilting. It's hard for me to remember to stay 1/4 in away from the edge. It helps when I sew the edge down about 1/8 in from the edge. You just get on roll and those feathers start flying! Love your quilt, front and back look awesome. You quilt looks fabulous. I like your colors, and I especially like how you finished the back. I, too, hope for no more snow this winter! Thanks so much for hosting TGIFF. Fantastic quilting Leanne -- and the quilt itself is just adorable. Thanks for serving tea and sandwiches for the party !! What a great quilt! Good job! The quilt looks lovely and I love your quilting!!! 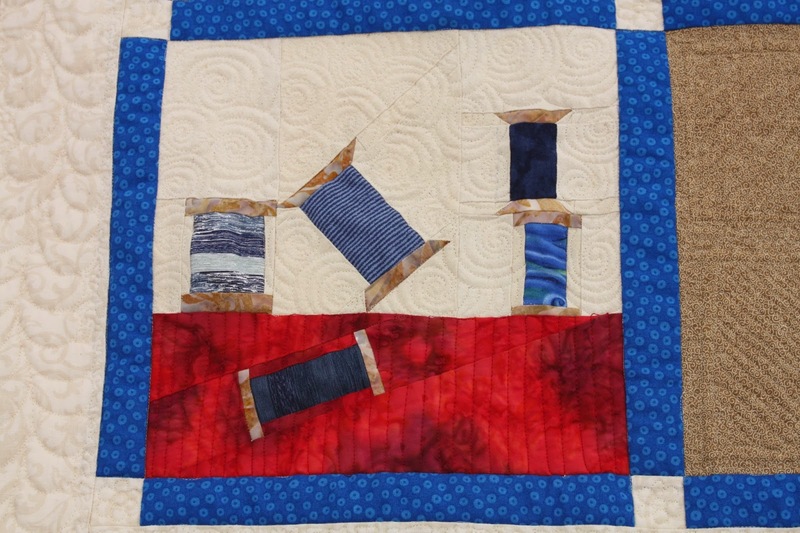 Beautiful blocks & quilting ! I am so glad I did not miss this reveal! Your quilting feathers are just perfect, I love love all the little details of this quilt!